As you build your mechanical engineering skills, build your resume as well so you're ready for the next job opportunity, says resume expert Kim Isaacs. 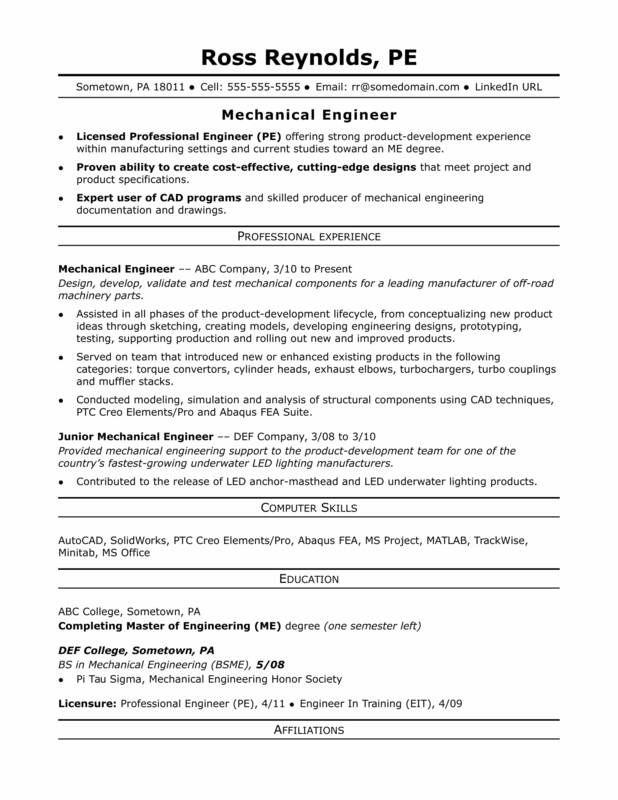 Get ideas from this sample resume for a midlevel mechanical engineer that Isaacs created below, and download the midlevel mechanical engineer resume template in Word. And if you need more help, get a free resume evaluation from the experts at Monster's Resume Writing Service. Jobs for mechanical engineers are projected to grow by 9% (or 25,300 jobs) from 2016 through 2026, according to the Bureau of Labor Statistics (BLS). You'll find the highest level of employment for this job in the following states: Michigan, California, Texas, Illinois, and Ohio; and in the following metropolitan areas: Warren, MI; Detroit; Chicago; Houston; and Los Angeles. In terms of salaries, you can expect to earn a median wage of $85,880 per year (or $41.29 per hour) as a mechanical engineer, according to the BLS. Proven ability to create cost-effective, cutting-edge designs that meet project and product specifications. Expert user of CAD programs and skilled producer of mechanical engineering documentation and drawings. Assisted in all phases of the product-development lifecycle, from conceptualizing new product ideas through sketching, creating models, developing engineering designs, prototyping, testing, supporting production and rolling out new and improved products. Served on team that introduced new or enhanced existing products in the following categories: torque convertors, cylinder heads, exhaust elbows, turbochargers, turbo couplings and muffler stacks. Conduct modeling, simulation and analysis of structural components using CAD techniques, Creo Elements/Pro and Abaqus FEA Suite. Provided mechanical engineering support to the product-development team for one of the country’s fastest-growing underwater LED lighting manufacturers. Contributed to the successful release of two LED anchor-masthead and three LED underwater lighting products.